Twenty years later, questions endure about how and why the nation abruptly dissolved. This essay is an expanded version of an article that appeared in The Nation on the fifteenth anniversary of the end of the Soviet Union. Asked to evaluate the French Revolution nearly 200 years later, the Chinese Premier Zhou Enlai was famously reported to have replied, “Too early to say.” Though apocryphal, the long perspective attributed to Zhou is better informed than the certitudes of American commentators about the causes and consequences of the end of the Soviet Union only twenty years ago. Consider four explanations routinely given. The Soviet Union ended because it was “illegitimate.” The Communist state was toppled by a democratic revolution from below. The system crumbled because “its economy collapsed.” The Soviet Union was an empire, and “all empires die.” In addition to contradicting one another, all these explanations are flawed: the first is simply ideological; no real evidence exists for the second or the third; and academic specialists disagree as to whether the Soviet Union, not to be confused with its satellite governments in Eastern Europe, was an empire or a multiethnic state. This history-changing event took place surreptitiously at a secluded hunting lodge in the Belovezh Forest near Minsk, in what is now Belarus. On December 8, 1991, heads of three of the Soviet Union’s fifteen republics, led by Boris Yeltsin of Russia, met there to sign documents abolishing the Soviet state. Accordingly, most American specialists no longer asked, even in light of the large-scale human tragedies that followed in the 1990s, if a reforming Soviet Union might have been the best hope for the post-Communist future of Russia or any of the other former republics. On the contrary, they concluded, as a leading university authority insisted, that everything Soviet had to be discarded by “the razing of the entire edifice of political and economic relations.” That kind of nihilism underlay the “shock therapy” so assiduously urged on Russia in the 1990s by the Clinton administration, which turned the country, as a columnist in the centrist Literary Gazette recently recalled, into “a zone of catastrophe.” None of the policy’s leading proponents, such as Larry Summers, Jeffrey Sachs and former President Clinton himself, have ever publicly regretted the near-destruction of essential consumer industries, from pharmaceuticals to poultry, or the mass poverty it caused. Nor have any US policy-makers or mainstream media commentators asked if the survival of a democratically reconstituted Soviet Union—one with at least three or four fewer republics—would have been better for the world: If during the past twenty years there would have been less ideological zealotry, aggressive nationalism, civil war, terrorism, nuclear proliferation, unwise American and NATO military interventions, unregulated global finance and even divisions in Europe. Almost certainly there would have been, but here too triumphalist certitudes continue to dominate the US political and media establishments. A majority of Russians, on the other hand, as they have repeatedly made clear in opinion surveys, still lament the end of the Soviet Union, not because they pine for “Communism” but because they lost a familiar state and secure way of life. In March 2011, to take a recent example, 59 percent of those surveyed said they “regret” the Soviet breakup while only 24 percent did not. Indeed, in December, 74 percent of readers of even a liberal Moscow newspaper said they regretted it. No less important, most Russians do not share the nearly unanimous Western view that the Soviet Union’s “collapse” was “inevitable” because of inherent fatal defects. They believe instead, and for good empirical reasons, that three “subjective” factors broke it up: the unduly rapid and radical way—not too slowly and cautiously, as is said in the West—Gorbachev carried out his political and economic reforms; a power struggle in which Yeltsin overthrew the Soviet state in order to get rid of its president, Gorbachev, and to occupy the Kremlin; and property-seizing Soviet bureaucratic elites, the nomenklatura, who were more interested in “privatizing” the state’s enormous wealth in 1991 than in defending it. In addition, a growing number of Russian intellectuals have come to believe that something essential was tragically lost—a historic opportunity, thwarted for centuries, to achieve the nation’s political and economic modernization by continuing, with or without Gorbachev, his Soviet reformation. While the Soviet breakup led American specialists back to cold war–era concepts of historical inevitability, it convinced many of their Russian counterparts that “there are always alternatives in history” and that a Soviet reformation had been one of the “lost alternatives”—a chance to democratize and marketize Russia by methods more gradualist, consensual and less traumatic, and thus more fruitful and less costly, than those adopted after 1991. Most generally, there were ominous parallels between the Soviet breakup and the collapse of czarism in 1917. In both cases, the end of the old order resulted in a near total destruction of Russian statehood that plunged the country into prolonged chaos, conflict and misery. Russians call what ensued smuta, a term full of dread derived from previous historical experiences and not expressed in the usual translation, “time of troubles.” Indeed, in this respect, the end of the Soviet Union may have had less to do with the specific nature of that system than with recurring breakdowns in Russian history. The similarities between 1991 and 1917, despite important differences, were significant. Once again, hopes for evolutionary progress toward democracy, prosperity and social justice were crushed; a small group of radicals, this time around Yeltsin, imposed extreme measures on the nation; fierce struggles over property and territory tore apart the foundations of a vast multiethnic state; and the victors destroyed longstanding economic and other essential structures to build entirely anew, “as though we had no past.” Once again, elites acted in the name of a better future but left society bitterly divided over yet another of Russia’s perennial “accursed questions”—why it had happened. And again the people paid the price. All of those recapitulations unfolded, amid mutual (and lasting) charges of betrayal, during the three months from August to December 1991, when the piecemeal destruction of the Soviet state occurred. The period began and ended with coups (as in 1917)—the first a failed military putsch against Gorbachev organized by his own ministers in the center of Moscow, the second Yeltsin’s liquidation of the state itself in the Belovezh Forest. What followed was a revolution from above against the Soviet system of power and property by its own elites. Looking back, Russians of different views have concluded that during those months political extremism and unfettered greed cost them a chance for democratic and economic progress. Certainly, it is hard to imagine a political act more extreme than abolishing what was still a nuclear superpower state of 286 million citizens. And yet, Yeltsin did it, as even his sympathizers acknowledged, precipitously and in a way that was “neither legitimate nor democratic.” A profound departure from Gorbachev’s commitment to social consensus and constitutionalism, Yeltsin’s actions were a return to the country’s “neo-Bolshevik” tradition of imposed change, as many Russian, and even a few Western, writers have characterized it. The ramifications were bound to endanger the unprecedented democratization achieved during the preceding six years of perestroika. At the time of the breakup, Yeltsin and his aides promised, for example, that their extreme measures were “extraordinary” ones, but as had happened before in Russia, most recently during Stalin’s forcible collectivization of the peasantry in 1929–33, they grew into a system of rule. (Shock therapy was already being planned.) Those initial steps also had a further political logic. Having ended the Soviet state in a way that lacked legal or popular legitimacy—in a referendum only nine months before, 76 percent of the large turnout had voted to preserve the Union—the Yeltsin ruling group quickly began to fear real democracy. In particular, an independent, freely elected Parliament and the possibility of relinquishing power in any manner raised, according to Russians with impeccable democratic credentials, the specter of “going on trial and to prison.” And indeed Yeltsin’s armed overthrow of the Russian Parliament, in October 1993, soon followed. The economic dimensions of Belovezh were no less portentous. Dissolving the Union without any preparatory stages shattered a highly integrated economy. It was a major cause of the collapse of production across the former Soviet territories, which fell by almost half in the 1990s. That in turn contributed to mass poverty and its attendant social pathologies, which still blight Russian life today. The economic motivation behind Soviet elite support for Yeltsin in 1991, as opposed to the “socialist” Gorbachev, was even more ramifying. As a onetime Yeltsin supporter wrote thirteen years later, “Almost everything that happened in Russia after 1991 was determined to a significant extent by the divvying-up of the property of the former USSR.” Here too there were foreboding historical precedents. Twice before in twentieth-century Russia the nation’s fundamental property had been confiscated—the landlords’ vast estates and bourgeoisie’s industrial and other large assets in the revolution of 1917–18, and then the land and livestock of 25 million peasant farmers in Stalin’s collectivization drive. The aftereffects of both episodes plagued the country for years to come. One of the most ideological myths surrounding the end of the Soviet Union was, to quote both another Times columnist and a leading American historian, that it “collapsed at the hands of its own people” and brought to power in Russia “Yeltsin and the democrats”—even “moral leaders”—who represented the people. (In this mythical rendition, their “achievements” have been reversed by Putin, most recently in the protested parliamentary election in December.) No popular revolution, national election or referendum having mandated or sanctioned the Soviet breakup, there was no empirical evidence for this supposition. As for Yeltsin’s role, even the most event-making leaders need supporters. Yeltsin abolished the Soviet Union in December 1991 with the backing of a self-interested alliance. All of its groups called themselves “democrats” and “reformers,” but the two most important were unlikely allies: the nomenklatura elites who were pursuing the “smell of property like a beast after prey,” in the revealing metaphor of Yeltsin’s own chief shock therapist, Yegor Gaidar, and wanted property much more than they wanted democracy or free-market competition; and an avowedly pro-democracy wing of the intelligentsia. Traditional enemies in the pre-Gorbachev Soviet system, they colluded in 1991 largely because the intelligentsia’s radical market ideas seemed to justify nomenklatura privatization. But the most influential pro-Yeltsin intellectuals, who played leading roles in his post-Soviet government, and who were hailed in Washington as “real reformers,” were neither coincidental fellow travelers nor real democrats. Since the late 1980s, they had insisted that free-market economics and large-scale private property would have to be imposed on a recalcitrant Russian society by an “iron hand” regime. This “great leap,” as they extolled it, would entail “tough and unpopular” policies resulting in “mass dissatisfaction” and thus would necessitate “anti-democratic measures.” Like the property-seeking elites, they saw Russia’s newly elected legislatures as an obstacle. Admirers of Gen. Augusto Pinochet, who had brutally imposed economic change on Chile, they said of Yeltsin, now their leader, “Let him be a dictator!” Not surprisingly, they cheered (along with the Clinton administration and the American mainstream media) when he used tanks to destroy Russia’s popularly elected Parliament. 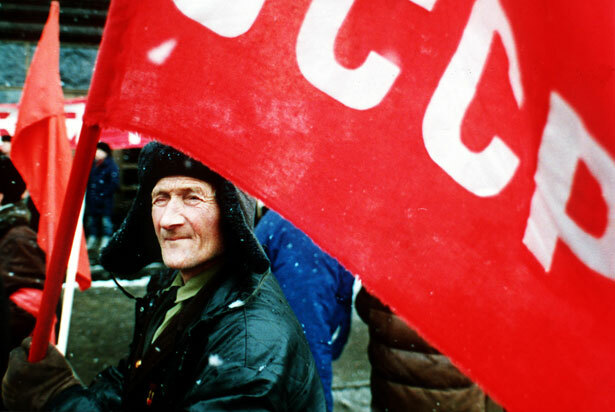 Political and economic alternatives still existed in Russia after 1991. Other fateful struggles and decisions lay ahead. And none of the factors contributing to the end of the Soviet Union were inexorable or deterministic. But even if authentic democratic, market and nationalist aspirations were among them, so were cravings for power, elite avarice, extremist ideas and widespread popular perceptions of illegitimacy and betrayal. All of these factors have continued to play a role since 1991, but it should have been clear at the time that the latter would prevail. The product of historical legacies and specific political circumstances, the Soviet Union as it was cannot be re-created. In October, however, no doubt timed both for the twentieth anniversary of the breakup and his intended return to the Russian presidency in the March 2012 election, Putin proposed the creation of a “Eurasian Union” that would unite Russia and other former Soviet republics willing to join. Two, it seems—Kazakhstan and Belarus, which have already formed a Customs Union and Common Economic Space with Moscow—have agreed; other small ones may soon do so. Much will depend on how many former republics, now independent states, and perhaps Russians themselves, believe Putin’s assurance: “We are not talking about re-creating the USSR in one form or another. It is naïve to try to restore or copy something that is already in the past.” The Soviet Union may have died or, as many Russians believe, been killed, but as for its afterlife—too early to say. Stephen F. CohenStephen F. Cohen is a professor emeritus of Russian studies and politics at New York University and Princeton University. A Nation contributing editor, his new book War With Russia? From Putin & Ukraine to Trump & Russiagate is available in paperback and in an ebook edition.